PROJECT SUMMARY: Sometimes really unique projects come across our office. This was one of those cool and different requests we received. Revolution Mill & Kau Restaurant Bar and Grill reached out to Southern Lights to help enhance this magnificent and large campus with purposeful outdoor lighting design. Their first interest and need was to help enhance the look and feel of the large bridge leading to their main restaurant Kau (formerly Natty Green’s Kitchen & Market). Guests must park on one side of the bridge and walk across to reach the restaurant and shops. The lighting that was in place wasn’t very intriguing or in line with the style of this rustic metal bridge. Revolution Mill & Kau Restaurant wanted a quick and temporary solution to give the bridge some stature and interest for the holiday season. Several ideas were discussed including color changing lamps, but the simple and classic warm white lights were chosen to drape across the beautiful bridge. These Christmas lights are an interim solution until final lighting design plans for permanent lighting on the bridge are approved. Even though this lighting design was simple, Southern Lights still spent time developing the layout and lighting design. During the design phase, Southern Lights provided the customer with additional lighting options that could be added onto down the road. The goal with any outdoor lighting design is to capture the essence of the subject, (in this case, the bridge), creating the most ideal landscape lighting effect. LANDSCAPE LIGHTING FOCUS: This is an easy one. The Bridge. Southern Lights Outdoor Lighting & Audio was tasked to design and install a powerful statement for this beautiful bridge. One of the lighting design requirements for this temporary low voltage lighting system on Revolution Mill & Kau Restaurant’s bridge was that it not only help with the safety aspect of illuminating the decking for foot traffic, but to be a focal point from Yanceyville St. Due to the size and scope of the Revolution Mill’s campus, the landscape lighting on the bridge needed to be visible from a distance (over 1000 feet away) or we would run the risk of a very “underwhelming” effect. More attention to the architectural details and arched of the bridge will come with the 2nd layer of outdoor lighting during phase two. Safety lighting was needed to address the surface of the bridge for walking in an area that is overly dark over a body of water. Security lighting was needed to help provide adequate illumination for not only the walking path, but provide some reflective lighting that would broadcast beyond the bridge helping to remove shadows. LOCATION: The lighting designs and installation for this Revolution Mill project can be found off of Yanceyville St and Cornwalis Ave in Greensboro, NC 27405. LANDSCAPE LIGHTING DESIGN: Ideal landscape lighting should evoke Safety. Security. SERENITY and should always start with a design. Southern Lights likes to start with “The End in Mind,” meaning that our lighting designs and installations are built for flexibility. Adequate lighting with a lot of flexibility was Southern Lights main objective since this lighting effect was only meant to be temporary. Southern Lights has the opportunity to work with a lot of amazing clients and this staff was no different. There is so much positive excitement about what this property is doing and offering in the way of office work-spaces, restaurants, events, weddings, and apartments it is contagious and we are excited to be a part of this journey with Revolution Mill & Kau Restaurant Bar and Grill providing professional landscape lighting design and installation for years to come on this property as it evolves and grows. HURDLES TO OVERCOME: Designing an ideal landscape lighting system takes planning. Getting light to the right place takes some skill and time to coordinate installing wire to the desired location. Timing and power were our only real hurdles on this project. Christmas was fast approaching when Revolution Mill reached out to Southern Lights Outdoor Lighting & Audio to help with one of their best Restaurants, Kau Restaurant & Bar. In the holiday lighting business, the season is very short and materials sell out very quickly. Once we got the go ahead, product was sourced. We struggled to find product that wasn’t out of stock that fit the parameters needed. Luckily one of our preferred vendors worked their magic and product was ordered. The lighting was installed the same day it landed at our shop giving the Revolution Mill campus about a week and a half window before Christmas to be enjoyed through the holiday season. Power was also an initial need to be able to support not only our temporary holiday lighting, but also to support permanent outdoor lighting on the bridge in the near future. The team at Revolution Mill moved quickly to provide us power and this project is now history. 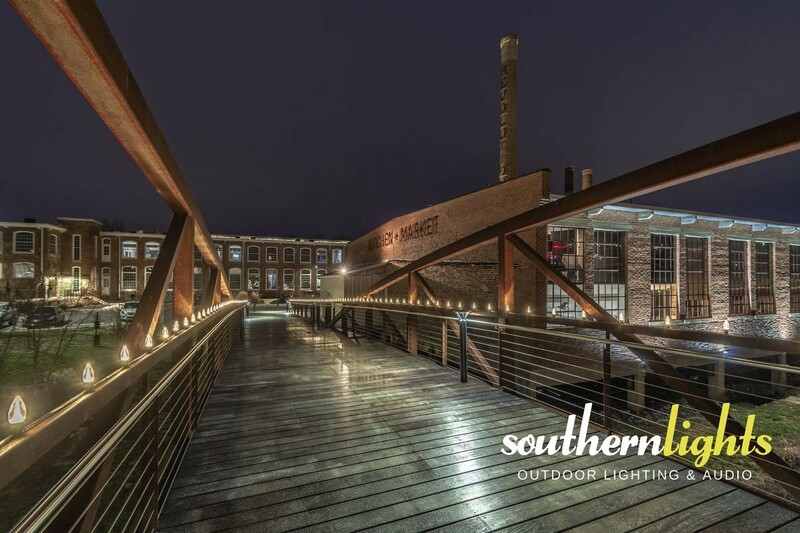 The Revolution Mill team ultimately trusted Southern Lights with the lighting designs allowing us to provide them with the most ideal landscape lighting effect with the best lighting fixtures for the space and structure. We think it turned out pretty awesome! We hope you did too!